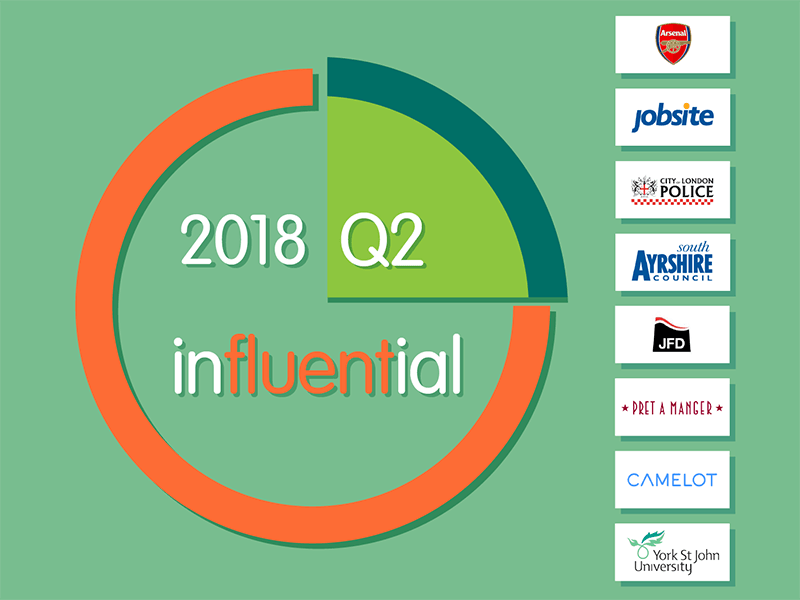 Carrying on from our success in Q1, Influential Software has gone from strength to strength with new clients in Q2, 2018. From a premier league football club to a police force, from a global sandwich chain to a well-known university, our team has made a tangible difference to UK businesses this quarter. These organisations have benefitted from services across our capabilities, from licence sales to training, data migration to upgrades. As well as the immediate advantage of speed and value, these organisations have also begun to see long-term returns in efficiency, engagement, insight, and agility. Arsenal Football Club has the longest streak in the top division of any English football club, and has the second-highest number of top-flight wins in English football history. The club has been estimated the third most valuable in England (in 2018) with a worth of $2.24 billion. Arsenal turned to Influential Software to provide the agile and integrated framework that allows the club to pursue its business and sporting goals. Jobsite.co.uk is part of the UK’s largest hiring platform, providing access to over 280,000 job adverts. The site makes searching for jobs faster and easier with tools such as job recommendations based on users’ skills and experience, and instant job alerts to notify users of new opportunities. Influential Software’s vast experience with handling all kinds of data allowed us to solve the company’s challenges with minimal disruption. The City of London Police is the territorial police force responsible for the City of London, separately from the London-wide Metropolitan Police Service. Due to its law enforcement activities in the financial centre of the UK, the City of London Police is known as the leading force for the investigation of economic crime, such as fraud. Influential Software’s successful projects with a number of public sector organisations – including local councils and the NHS – attracted the City of London Police to our services. South Ayrshire Council is a local council on the western coast of Scotland. The council covers 1,222 kilometres and had a population of 112,400 in 2015. South Ayrshire Council places an emphasis on community planning and collaboration between public service providers and local residents. Working with NHS Ayrshire and Arran and Police Scotland, the council aims to design joint services to meet local needs more effectively. Influential Software’s experience with local councils across the country was a tangible advantage in our work with South Ayrshire Council. JFD Global is a part of James Fisher & Sons Plc, specialising in diving, submarine, and hyperbaric rescue, technical solutions and services. The company provides submarine rescue capability and submarine escape training, as well as supplying diving equipment. With our strong record of work with service industries and manufacturing, Influential Software was the natural choice for JFD Global. The General Data Protection Regulation (GDPR), adopted in April, came into effect on May 25 2018. As strong advocates and implementers of data security, Influential Software welcomed the new regulations. Our team is on hand to address any concerns UK businesses might have around GDPR and provide fast solutions to ensure compliance. Founded in 1983, Pret A Manger is a UK-based sandwich shop with around 500 shops across nine countries. Pret A Manger announced growth of 13.2 percent in the year of 2017, launching 58 new stores during that period. Influential Software’s previous work with high-street names such as John Lewis and House of Fraser showed Pret that we had the enterprise-grade skill to meet their software demands. Camelot Group is responsible for operating the UK National Lottery, being first awarded the lottery franchise in 1994. The group is active in designing new games, digital platforms, and e-commerce solutions. Camelot Group launched a mobile games platform in 2014. Influential Software’s experience of both public sector organisations and commercial enterprises provided a perfect combination for addressing Camelot Group’s IT needs. York St John University is a public university located in York, England. The university had almost 6,000 students as of 2016-17. The university campus has undergone work to the value of £100m over the past decade, with features including a new library and IT facilities, accommodation, science labs, 57-acre sports park, and Students’ Union building. Our proven success with higher education institutions such as the University of Brighton and Oxford Brookes University held strong appeal for York St John University. What Does Q3 Hold in Store? Gathering steam through Q1 and Q2, Influential Software is showing its expertise in all kinds of industries this year. But one thing’s for sure: there are many influential clients yet to come.